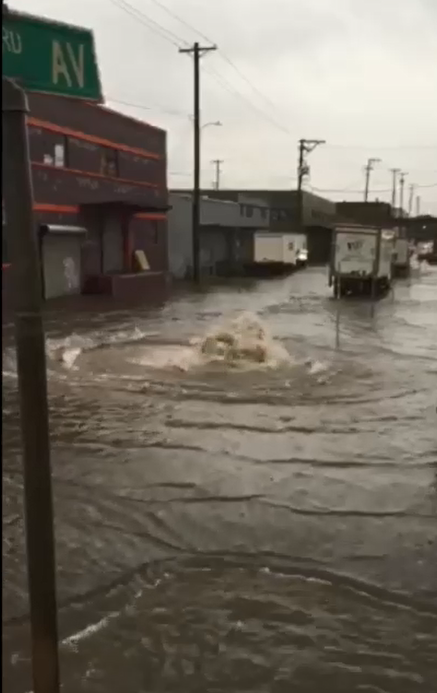 The City of Portland, Oregon has cause to model instances of street flooding in the vicinity of hydraulic drop structures that feed into the Willamette combined sewer overflow tunnel system. Reproducing the events with a collection system model based on the U.S. EPA’s Storm Water Management Model (SWMM) requires the representation of friction losses in the vortex generator structures. A modeling study was undertaken to better understand flows and losses in these structures, leading to enhancements to the City’s collection system model to benefit the assessment of mitigation alternatives. A conceptual approach to representing the head losses in vortex structure generators within a SWMM-based modeling framework was developed, and the general applicability of the approach was tested through a series of computational fluid dynamics (CFD) model simulations covering a range of flow conditions. The CFD modeling demonstrated that the conceptual approach could represent head losses under the conditions of primary interest, which were fully submerged conditions with the potential to cause surface flooding. When the approach was implemented in SWMM, the observed flooding events were qualitatively reproduced. The City of Portland sewer system has experienced flooding issues at structures associated with the Stark consolidation conduit, which diverts wet weather flow from the Stark and Oak combined sewer basins to the East Side CSO tunnel through the Alder shaft vortex drop structure. A profile of the system is shown in Figure 1 and a plan view of the system is shown in Figure 2. Figure 1 Profile view of Stark and Oak consolidation conduits. Figure 2 Map of Stark and Oak consolidation conduits. Level monitoring data indicates that backwater conditions extend into the consolidation conduits from the CSO tunnels during tunnel filling events, including two events on 2015-10-31 and 2015-12-07. 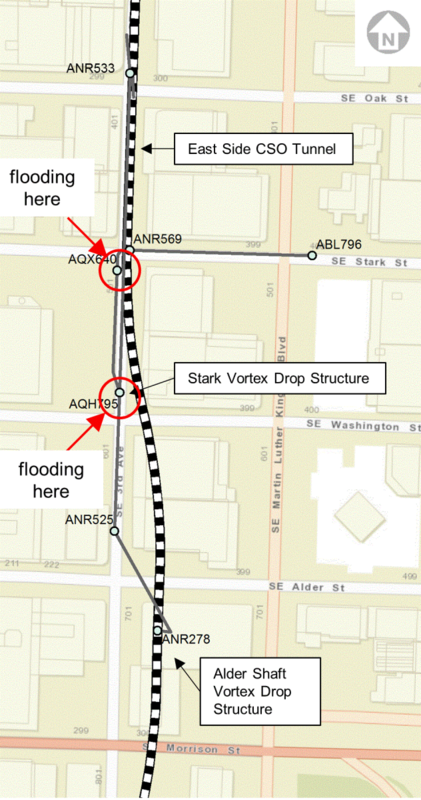 In both of these events, flooding to grade occurred on SE 3rd Avenue near SE Washington Street (above the Stark vortex drop structure) and near SE Stark Street, as indicated in Figure 2. The flooding occurred over relatively short periods, between 1 h and 2 h, and was confined to areas of the order of one city block. Figure 3 shows a representative photograph. Figure 3 Flooding event on 2915-10-31 at corner of Stark St. and 3rd Ave. The City of Portland Bureau of Environmental Services (BES) simulated these events using its XP-SWMM model of the collection system, but the observed flooding could not be reproduced with the model. BES concluded that the XPSWMM model did not account for head losses resulting from complex flow patterns in the vortex drop structures. While losses could be introduced to the SWMM model by use of entrance and exit loss coefficients on individual links, this approach was initially not favoured for two reasons: it may not be transferable to other, similar structures in the system, and it may not distinguish between free discharge and submerged conditions in the drop structures. To further investigate the flow patterns in the drop structures, a model of the Alder–Oak–Stark system was developed, using the open source computational fluid dynamics (CFD) software package OpenFOAM. The CFD model results were used to guide development of a headloss based approach for modeling the structures that could be incorporated into BES’ collection system model. This paper documents the development and application of the CFD model, and presents the one-dimensional modeling approach suitable for SWMM based models. BES developed inputs for modeling the flooding events, consisting of collection system model outputs for the flows being conveyed to the Stark and Oak consolidation conduits, and water surface elevations (WSEs) at the Alder shaft. The elevations were derived from measurements at the Steel and Taggart shafts, which are immediately upstream and downstream of the Alder shaft, where measurements were not available. No quantitative data were available for the flow rate or duration of the actual flooding. Table 1 provides the maximum total inflow rate to the Alder shaft for each event, as well as two WSEs at the shaft: one representing the level at the time of the peak inflows, and the other representing the maximum level from the entire event. Table 1 also includes an event from 2013-09-28 for comparison; this event, which flooded the consolidation sewers but did not flood to grade, was previously investigated as part of a study investigating pneumatic issues (Klaver et al. 2016). Table 1 Peak inflow rates and HGLs associated with modeled events. The September and October events had similar maximum inflow rates, but for the September event this peak was reached while the WSE in the tunnel was well below grade; in the October event, on the other hand, the WSE concurrent with the peak inflow was high enough to submerge the Alder shaft vortex drop structure. In the December event the peak inflow rate was less than in the October event, but it occurred when the tunnel WSE was essentially at its highest point during the event. These observations suggest that the instances of flooding are the result of high inflows concurrent with high tunnel WSEs. An improved representation of the losses in the drop structures was sought for BES’ collection system model. The general concept was to use some form of rating curve to relate discharge to head, which would be developed from theoretical considerations and then verified using a CFD model of the structures and connecting sewers. The results thus derived could not be directly calibrated because of the lack of measurements of flooding rate and duration. Instead, a presence or absence of flooding approach was taken, along with a qualitative comparison of the intensity and duration of flooding at the two locations. Hydraulic structures that are subject to tailwater effects may be represented by two-dimensional lookup tables, where the discharge is a function of both the upstream and the tailwater depths (Franz and Melching, 1997). For tailwater depths that are below what may be termed the free flow limit, a single-valued relationship between upstream depth and discharge is defined; once the tailwater depth is great enough to affect discharge, however, the relationship is instead between differential head and discharge. In some cases, this relationship may itself be dependent on tailwater depth, so a family of curves is developed, each for a different tailwater depth; this gives rise to the two-dimensional lookup table concept. As SWMM does not support two-dimensional lookup tables, an alternative approach is to use multiple rating curves in parallel, and to choose which to use with control rules based on tailwater depth.. The hydraulic performance of tangential vortex generator structures has been studied in considerable detail, primarily in the interest of developing consistent design approaches (Jain 1984; 1989). For free-flowing conditions, theoretical approaches for developing rating curves have been developed that perform well in comparison with physical modeling (Yu and Lee 2009). For submerged conditions, published data are lacking. It also appears open to speculation as to when tailwater depth begins to affect the relationship between discharge and upstream depth. When the entire structure is fully submerged, however, it is reasonable to expect an orifice type of relationship based on the cross sectional area of the smaller of the drop tube or the throat. In the interest of simplicity, we represent tangential vortex structures using two rating curves in parallel: a theoretical curve based on design approaches for free discharge conditions, and an orifice type curve for submerged conditions. This approach, by design, will not reproduce the characteristics for the transition between free discharge and full submergence; however, as the focus of the effort is to provide an accurate estimate of flooding conditions, these mid-level effects may reasonably be excluded. A computational fluid dynamics (CFD) model of the drop structures was also developed, so that additional insight into the behaviour of the structures under various conditions might be gained. The goal was to be able to determine the reasonableness of the simplifying assumptions in the 1-D model, and to assist in the implementation of certain details in the subsequent design process. An effort was made to develop the CFD model in a way that facilitated comparison between its output and the standard, 1-D hydraulic calculations that characterize SWMM results. We note that the relationship between a specified channel roughness and normal depth for a given discharge cannot be directly translated back and forth between the 1-D Saint-Venant equations and the 3-D Reynolds-averaged Navier–Stokes equations. However, it is clearly useful to be able to parameterize the CFD model so that friction slopes, in both open channel and pressurized regimes, are consistent with their counterparts in a 1-D SWMM model using Manning’s roughness coefficients. This desire guided the selection of certain aspects of the CFD framework. The CFD model was built using OpenFOAM, which is an open source C++ library originally developed by Weller (1998). The flow solvers in OpenFOAM can be applied to both single phase and multi-phase flows with either laminar or turbulent Navier–Stokes equations. As the given application required simulation of free surface flow, the interFOAM solver was selected; this solver applies the volume of fluids (VOF) phase fraction based technique (Hirt and Nichols 1981) to track air–water interfaces. For turbulence closure, the k-omega SST model was used (Menter et al. 2003); this model is a blend of the k-omega and k-epsilon models. A rough wall function was also used, wherein roughness heights were specified in a manner consistent with the use of Manning’s roughness coefficients. Each feature of the system was drawn to scale in AutoCAD and exported for use as the bounding domain for the CFD mesh, which was developed using the snappyHexMesh mesh generator, which is a part of the OpenFOAM library. The final meshed domain is shown in Figure 4, and consists of 611 372 cells of which nearly 75% are hexahedra. Figure 4 Plan view of the CFD model domain of the Stark and Oak consolidation conduits. The CFD model requires boundary conditions capable of representing both open channel flow and surcharged conditions; these boundary conditions are specified at inlet points, the downstream outlet in the tunnel, locations open to the atmosphere (such as manholes), and all pipe and structure walls. There are two inlet boundaries specified in the CFD model; one is located at ANR533 and the other at ABL796. These two inlet boundaries are configured to accept a flow rate time series as their input, which is converted to an area-average velocity vector normal to the inlet boundary surface. In simulations with higher flow rates, the flows were allowed to increase to their steady state values to minimize the risk of computational instability. Both inlets were found to be sufficiently upstream from the areas of interest such that the boundary assumptions had negligible impact on the solution in the vicinity of the structures of interest. The outlet for the CFD model is located in the East Side tunnel under the Alder access shaft as shown in Figure 4. A total pressure boundary condition was applied to the outlet boundary condition; therefore both a static and dynamic head were needed as inputs. The static head for the outlet pressure was calculated from the interpolated Alder shaft level data for each steady-state simulation. The dynamic head was calculated from the total flow expected at the outlet at steady state along with the surface area of the outlet. 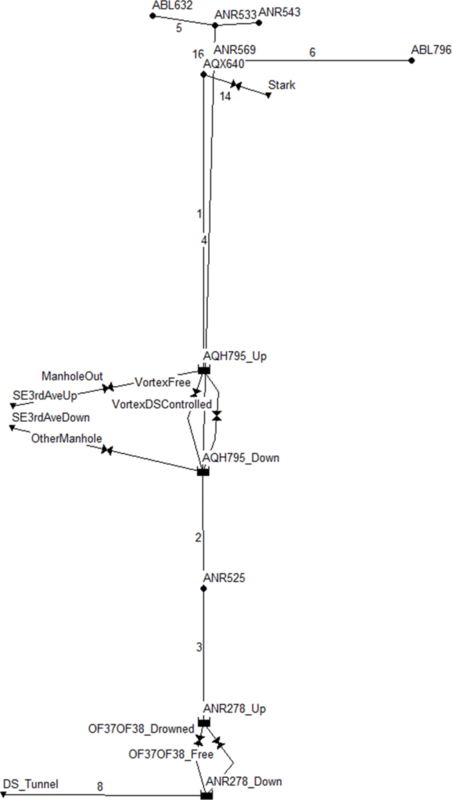 An atmospheric boundary condition was applied to several locations in the CFD model domain to ensure proper venting of the air phase: the Alder access shaft, the Alder shaft vortex drop structure, ANR525, the Stark drop structure, ANR533, AQX640, and ABL796. The atmospheric boundary was applied to a part of the surface mesh representing the ground elevation except for AQH795, AQX640 and ABL796, which had an additional volume of mesh above the ground elevation to accommodate surface flooding; for these three locations, part of the surface mesh at the top of this additional street level volume was designated as an atmospheric boundary. A no-slip boundary was applied to all remaining external mesh cells not previously specified as inlets, outlet, or atmospheric boundaries. The roughness height in the rough wall function was specified as 0.004 ft (0.001 22 m), corresponding to finished concrete. There were two phases of CFD modeling. The first phase was a general verification of the approach, which involved comparison of CFD results with standard hydraulic calculations, followed by a reproduction of the observed flooding events. The second phase involved the generation of a range of steady-state conditions that would be used to develop the rating curves for the SWMM model, which are discussed subsequently. A qualitative verification of the entire domain model was based on the occurrence, or non-occurrence, of flooding when replicating events in which flooding was, or was not, observed. As the run time of a full length simulation would be prohibitive, the observed events were simulated as pseudo-steady events based on various combinations of peak inflow and peak downstream water surface elevation, as summarized in Table 1 above. Flooding to grade did not occur in the CFD model for the 2013-09-28 event for either the maximum cumulative inflow or the maximum level conditions simulated. Flooding to grade did occur in the CFD model for both the 2015-10-31 and 2015-12-07 events at the locations indicated in Figure 2 above. Flooding also occurred at upstream locations in the model, where it was not observed in the actual events. We attribute this to excessive head that accumulated in the artificial street level volumes above the Stark drop structure and manhole AQX640 over the course of the simulation. To avoid this issue, some method of limiting the accumulation of flood volume above the structures would be required; for example, an increase in the domain to include additional street volume, or an unsteady simulation. Neither of these approaches were feasible within the scope of the study. The entire domain model is in good agreement with respect to both non-flooding and flooding events. CFD model output was extracted at locations corresponding to the link–node framework imposed by SWMM. Conceptually, each drop structure is modeled in SWMM using two junctions, one to represent the upstream side and a second for the downstream side. The rating curve links are then connected across the two junctions. The CFD results were post-processed to obtain time series for the parameters that would be used in developing the rating curves: discharge, depth for free surface conditions, and hydraulic head for surcharged conditions. Numerous locations in the model were selected for post-processing, so that an adequate understanding of model performance could be obtained. For development of the rating curves, the analysis was ultimately limited to four locations so as to be as consistent as possible with the assumptions used in SWMM. These locations are described in the subsequent sections, which discuss each structure individually. Discharge was calculated as total mass flux across a plane perpendicular to the axis of the pipe. As the model computes a velocity vector in each model cell, mass flux was obtained by a dot product operation between the components of the velocity vector and the unit normal vector of each cell surface; this operation was handled internally by OpenFOAM. For depth in open channel situations, the air–water fraction was averaged over the same interfaces used for discharge. The average air–water fraction can be interpreted as the fraction of the entire cross section that is filled with water, which can in turn be converted to depth using an appropriate mensuration formula. For WSE in surcharged conditions, an average total static pressure was calculated at each location. This was then converted to WSE based on the local invert elevation. For most model runs, the last 50 s of the model run represented reasonably steady conditions, and so the average values of the various parameters at each location were calculated over these 50 s periods, and then compiled into tables for further analysis. For this structure, CFD results were used from near the downstream end of conduit 1 and from the outlet portion of the tunnel. Nearly all of the runs involved totally submerged conditions for this structure, largely because it was necessary in order to produce sufficiently high head downstream of the Stark vortex drop structure to achieve limiting conditions. Therefore, information was not available to corroborate the theoretical curve for free-flowing conditions at this location. This result is considered acceptable, however, as it is appears unlikely that flooding will occur in the Stark conduit under such conditions. In addition, the applicability of the theoretical curve was confirmed for the Stark vortex drop structure (discussed subsequently), and as the dimensions of the tangential vortex generators at each location are nearly identical, it is reasonable to assume that the theoretical curve can be applied at the Alder shaft vortex drop structure for free surface conditions. Figure 5 summarizes the differential head between the entrance to the Alder shaft vortex drop structure and the main tunnel just downstream of the adit, versus the discharge through the structure; the values shown in the figure are also tabulated in Table 2. The line in Figure 5 is calculated from an orifice equation, using an area of 2.55 m2 (given by the width of the generator throat times its height) and a coefficient of discharge (Cd) of 0.647. The value of Cd was obtained by least-squares regression; while the value is lower than what one might assume based on the properties of the vortex generator, it should be noted that it also accounts for additional losses associated with the drop structure, including for example the change in flow direction through the adit. Figure 5 Discharge versus head loss at Oak–Stark drop structure for 17 CFD runs. 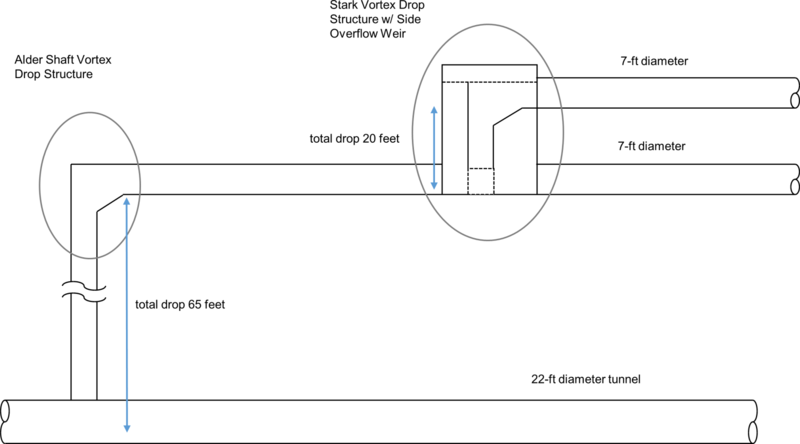 Table 2 Post-processed CFD results for discharge and hydraulic head at the Oak–Stark vortex drop structure. A transition point between free surface and surcharged conditions must also be defined, in order to select between the two rating curves in the SWMM application. The decision becomes arbitrary without specific model results on which to base it; however, the system would undoubtedly become surcharged once the WSE in the tunnel reaches the crown of the inlet to the vortex generator. For the present purpose, then, it was proposed that the transition point be a WSE of −1.53 ft (City datum), which represents the crown of conduit 1 where it joins the vortex generator structure. For this structure, CFD results were used from near the downstream end of conduit 4 (extending from the Stark St. sewer) and from near the upstream end of conduit 2. Flows were also quantified individually for the vortex generator and the weir. For model runs where the upper conduit was in open channel mode, depth was derived from the average air-water fraction at the downstream end of conduit 4. For model runs where the structure was surcharged, differential head across the structure was derived from the WSEs at the downstream end of conduit 4 and the upstream end of conduit 2. The analysis of this structure was complicated relative to that for the Alder shaft vortex drop structure because of the presence of the side overflow weir. The CFD model results showed that the extent to which the side flow weir was engaged varied considerably depending on the flows entering the structure, and the WSE below the structure. The highly unsteady behaviour did not suggest a simple relationship that would allow the weir to be represented as a unique object in SWMM; instead, it was concluded that a differential head-based curve be developed for fully surcharged conditions, similar to the approach used for the Alder shaft vortex drop structure. As with the other structure, certain details of hydraulic behaviour within the transition from open channel to surcharged mode would therefore not be reproduced in the SWMM model; however, the transition phase does not represent flooding conditions, which are of primary interest. For this structure, the CFD runs produced both open channel and surcharged conditions at the downstream end of conduit 4; there was also a range of WSEs below the structure, ranging from below the throat to full submergence. Figure 6 plots hydraulic depth at the upstream side of the Stark vortex drop structure (the downstream end of conduit 4) versus discharge through the structure, with the values tabulated in Table 3. The depths have been grouped in the figure according to the WSE downstream of the structure, as a means of understanding the importance of backwater conditions. The gray circles represent runs where the downstream elevation is below the invert of conduit 4 where it enters the vortex generator, and where it may be assumed that the depth is controlled at the entrance to the vortex generator. The light gray squares represent downstream HGLs between the invert and the side overflow weir, where the control point is uncertain. Lastly, the black triangles represent downstream WSEs above the crown of conduit 4, where the structure is fully submerged and the assumption of downstream control is justified. 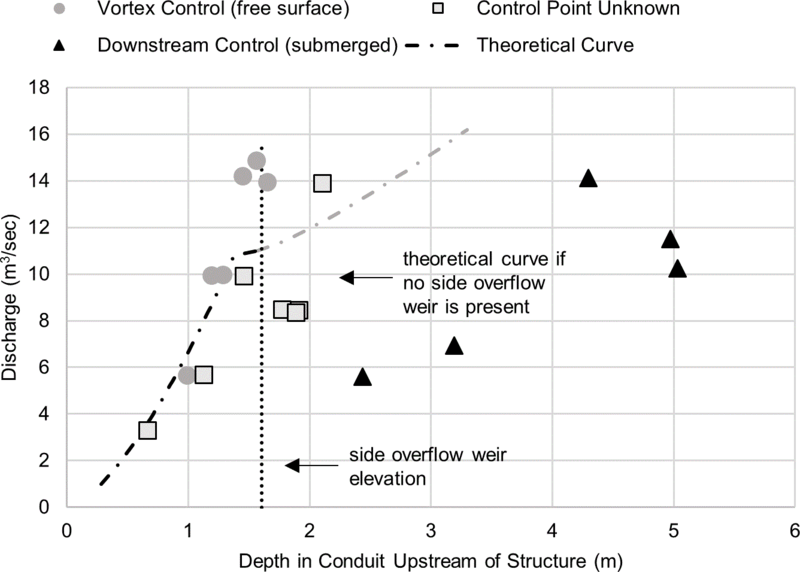 Figure 6 also includes a theoretical relationship between depth and discharge for the vortex generator, calculated after Jain (1984), which may be expected to hold for upstream depths up to the side overflow weir, provided the downstream WSE is below the control point. Figure 6 Discharge versus depth above the Stark drop structure for all CFD runs. Table 3 Post-processed CFD results for discharge and hydraulic head at the Stark drop structure. 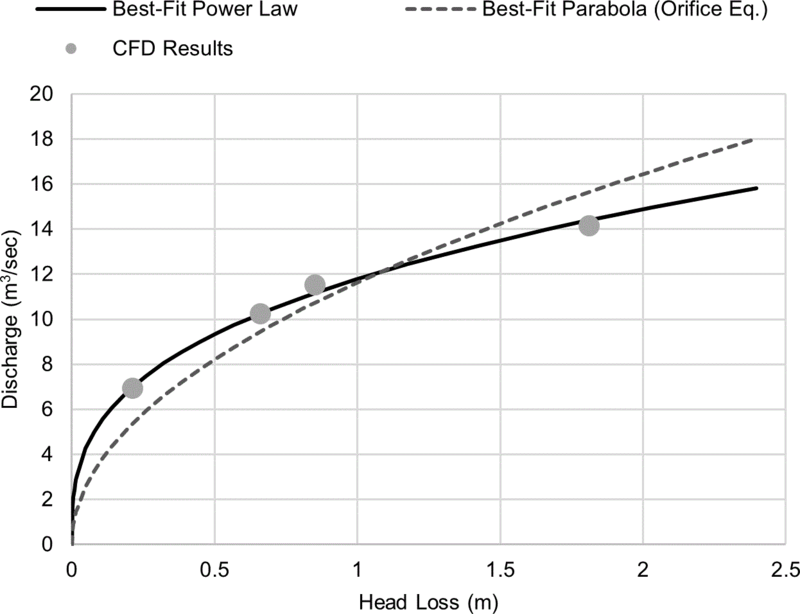 1Head loss is not calculated for free surface flow conditions. 2CFD run did not reach steady state at structure, so results were not used in regression. The information shown in Figure 6 has several notable features. First, there is a clear distinction between free surface and surcharged conditions, in that the free surface points follow a trend whereas the surcharged conditions (the black triangles) do not. The rational inference is that, for a fully submerged vortex generator, the upstream head is dependent on the downstream head, as with the Alder shaft vortex drop structure. Second, the free surface results lie close to the theoretical curve for downstream WSEs below the invert of the approach channel (gray circles). This situation generally holds up to the kink in the curve, which is actually a point where control of the depth shifts from the entrance of the structure to the throat. The reason for the departure from theory in this case appears to be the presence of the side overflow weir, which is not accounted for in the development of the theoretical curve. The weir becomes engaged at a depth of ~1.6 m, which is above the transitional depth of 1.4 m. Once the weir is engaged, it takes an increasingly larger portion of the flow and the corresponding increase in depth is limited. Last, for downstream WSEs between the approach channel invert and the crown of conduit 4, the results do not appear to follow the theoretical curve, especially for greater discharge. This result suggests that the WSE downstream of the structure is affecting the water surface profile in the vortex generator such that the theoretical development is no longer valid. The presence of the side overflow weir and the influence of downstream WSE together suggest that the theoretical curve is of limited value in describing conditions in the Stark vortex drop structure. The interaction of the various elements, while interesting, are no longer relevant once the structure becomes fully submerged, which is of primary importance in determining flooded conditions. Therefore, the free surface results were used to develop a single curve for unsubmerged conditions. Based on the results from runs where the downstream WSE was <6.3 m, the lower portion of the theoretical curve, which is simply critical depth for the given discharge, appears to be reasonable. The results for the surcharged runs are plotted in Figure 7 as discharge versus differential head between the inlet and outlet of the structure (the downstream end of conduit 4 and the upstream end of conduit 2, respectively). Here there is a relationship that represents the combined discharge through the vortex generator and the side overflow weir, which is expressed by a power law as shown in the figure. While the formula is empirical, the correlation is very good and the equation is suitable for implementation in SWMM via computation of a table. The figure also shows that a best fit parabola, as would describe a single orifice, does not fit the results nearly as well as the power law. 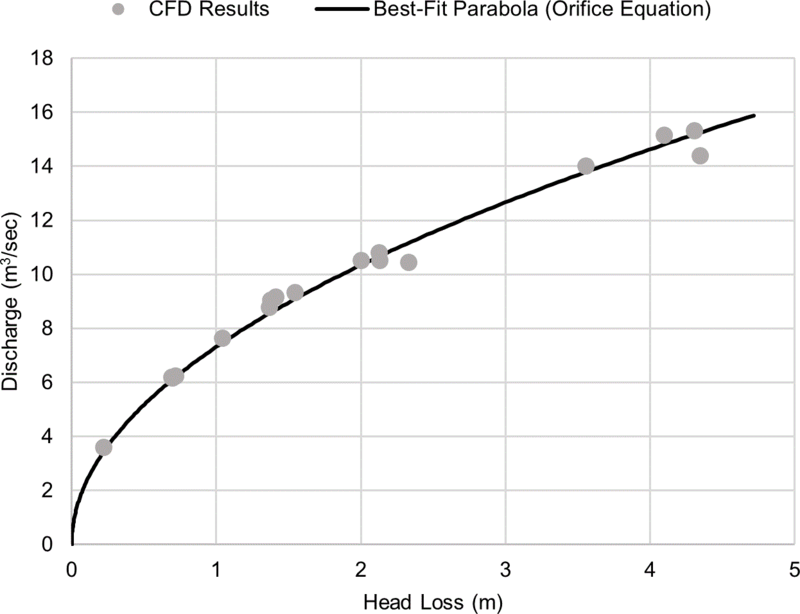 Figure 7 Discharge versus head loss through Stark drop structure for all CFD runs. What remains is to determine a transition point between the two curves, based on the WSE immediately downstream of the structure. The highest WSE at this location for the various free surface runs is 7.53 m, with all the remaining free surface runs at lower elevations. For the surcharged runs, the lowest WSE is 8.80 m. The gap in between includes both the side overflow weir (at 7.92 m) and the crown of the incoming pipe (at 8.45 m). Based on the approach taken for the Alder shaft vortex drop structure, the transition elevation was taken to be the crown of the incoming pipe at 8.45 m. Although it is reasonable to expect the hydraulic behaviour of the vortex generator to be affected at lower elevations, the presence of the weir masks this effect to some extent. Once the downstream level is at or above the weir, however, the vortex generator must be largely drowned, and the transition to full submergence of the structure should follow relatively rapidly; this is borne out by the CFD simulations, which suggest that the zone between partial and full submergence is narrow. A simplified SWMM model was constructed to test the performance of the proposed structure representations. The domain of the model was limited to the conduits that were included in the CFD model, along with two additional conduits upstream of manhole ANR533. A schematic of the SWMM model is shown in Figure 8. Figure 8 Layout of test application in SWMM. The boundary conditions consist of inflows at manholes ABL632, ANR543 and ABL796, and water surface elevation at ANR278 (the Alder shaft). The additional conduit in the SWMM model that goes from ANR278 to the outfall named “DS_Tunnel” was required because SWMM does not permit more than one link to be connected to an outfall object. The water surface elevation time series was imposed at the outfall after making an appropriate adjustment to account for the difference in elevation between the two nodal locations. Each structure was represented by a pair of storage nodes connected by two links. The dimensions of the upstream storage node for the Stark vortex drop structure were based on the vortex generator drawings, and the downstream node was based on the lower chamber of the structure; the overall storage volume of the two nodes was thus close to that of the existing structure. The upstream node for the Alder shaft vortex drop structure was also based on the vortex generator at that location, with the downstream node based on the central area of the Alder shaft. These choices may be adjusted within limits, but it is noted that the stability of the control schemes is dependent to a certain extent on the availability of storage in the controlling nodes. The link representations for the structures are summarized in Table 4. At the Stark vortex drop structure, tabular curves were used for both free surface and surcharged conditions, whereas at the Alder shaft vortex drop structure a tabular curve was used for free surface conditions and an orifice object was used for surcharged conditions. The SWMM model predicted flooding to grade at the Stark vortex drop structure and at manhole AQX640 for both the October and December events, consistent with observations. Flooding at the various locations was simulated using rectangular orifice links, with a width equal to the circumference of the manhole and a height of 3 in. (0.076 m). The model was also run using boundary conditions from the 2013-09-28 event, which was previously modeled in the transient pneumatic study (Klaver et al. 2016); no flooding was documented during this event, and the test SWMM application did not predict flooding either. The October and December modeled flooding events are shown in Figure 9 and Figure 10, respectively. The comparison is by necessity qualitative, as no measurements were made during the flooding events, but both the magnitude and duration of the flooding are consistent with the observed conditions. A conceptual approach to representing the head losses in vortex drop structures within a SWMM based modeling framework was developed, and the general applicability of the approach was tested by developing a computational fluid dynamics (CFD) model of the structures of interest. The CFD modeling demonstrated that the conceptual approach could represent head losses under the conditions of primary interest, which were fully submerged conditions with the potential to cause surface flooding. When the approach was implemented in SWMM, observed flooding events were reproduced at a qualitative level. The relationship between head loss and discharge through the Alder shaft vortex drop structure, when it is fully submerged, can be represented by an orifice link in SWMM, using the area of the vortex throat. The discharge coefficient can be selected so that it accounts for other minor losses in the structure, in addition to the contraction and expansion through the orifice itself. This result may be readily applied to other vortex drop structures of similar design. The relationship between head loss and discharge through the Stark vortex drop structure, when it is fully submerged, can be represented by an outlet link in SWMM, using a rating curve derived from the CFD results. The curve is empirical, in the form of a power law, and is similar albeit not identical to an orifice type of relationship. Given the complexity of the structure, which includes both a vortex generator and a side overflow weir, the rating curve is considered a reasonable approach, especially given the consistency of the CFD results for fully submerged conditions. The result is not readily transferred to other structures, however. For both structures, when not fully submerged, the relationship between discharge and the flow depth at the inlet to the vortex generator may be represented by the theoretical curve as developed by Jain (1984). This curve considers control at lower discharge to be at the top of the approach channel, shifting to the throat at higher discharge. In the case of the Stark vortex drop structure, which has a side overflow weir that is not considered in the theoretical development, and will affect the relationship at higher discharge, use of the curve should be restricted to the portion where control is at the approach channel. The transition between the curves used for unsubmerged and submerged conditions is recommended to be at the crown of the conduit where it enters the approach channel, for both of the structures. This approach may underrepresent the depth of flows in certain transitional situations, but it will still represent flooding conditions well. Moreover, a lower transition point may exaggerate head losses in transitional situations, resulting in flooding predictions where it is not expected to occur. Franz, D. D. and C. S Melching. 1997. Full Equations Model (FEQ) for the Solution of the Full, Dynamic Equations of Motion for One-Dimensional Unsteady Flow in Open Channels and through Control Structures. Denver, CO: U.S. Geological Survey Water-Resources Investigations. Report 96-4240. Hirt, C. W. and B. D. Nichols. 1981. “Volume of Fluid (VOF) Method for the Dynamics of Free Boundaries.” Journal of Computational Physics 39 (1): 201–25, 1981. Jain, S. C. 1984. “Tangential Vortex-Inlet.” Journal of Hydraulic Engineering. 110 (12): 1693–9. Jain, S. C. 1989. Air Transport in Vortex-Flow Drop Shafts. Journal of Hydraulic Engineering 114 (12): 1485–97. Klaver, P., D. Collins, K. Robinson and S. Bell. 2016. Modeling of Transient Pneumatic Events in a Combined Sewer Overflow Storage Tunnel System. Journal of Water Management Modeling 24: C409. doi: 10.14796/JWMM.C409. Menter, F. R., M. Kuntz and R. Langtry. 2003. “Ten Years of Industrial Experience with the SST Turbulence Model.” In Proceedings of the Fourth International Symposium on Turbulence, Heat and Mass Transfer, Antalya, Turkey, 12-17 October, 2003, edited by K. Hanjalic, Y. Nagano and M. J. Tummers. New York: Begell House. Weller, H. G., G. Tabor and C. Fureby. 1998. “A Tensorial Approach to Computational Continuum Mechanics Using Object-Oriented Techniques.” Computational Physics 12 (6): 620–31. Yu, D. and J. Lee. 2009. “Hydraulics of Tangential Vortex Intake for Urban Drainage.” Journal of Hydraulic Engineering 135 (3): 164–74.